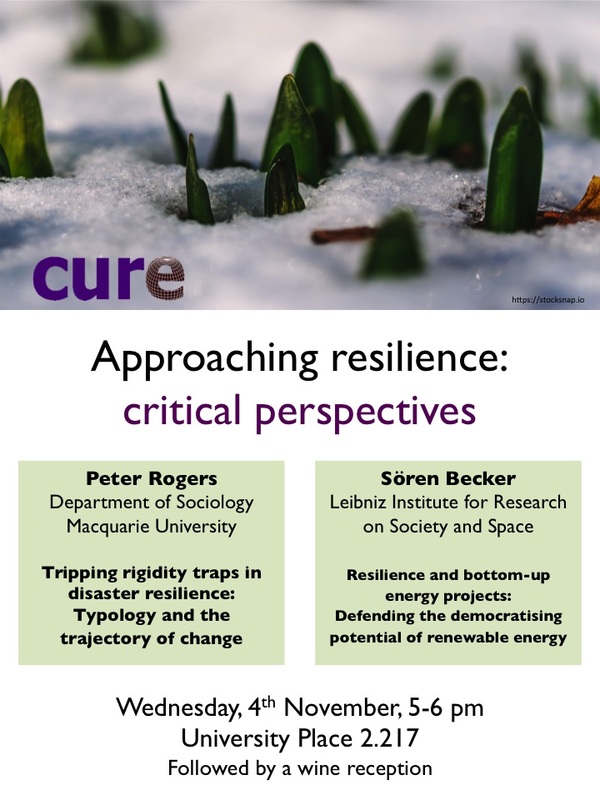 CURE is hosting an evening seminar with two well known resilience researchers based in Australia and Germany. It will will take place on the 4th of November in University Place, room 2.217, between 5 and 6 pm. Wine and nibbles will be available afterwards. The event is titled ‘Approaching resilience: critical perspectives’ and will be chaired by Dr Saska Petrova. The first speaker is Dr Peter Rogers, a Senior Lecturer in the Sociology of Law at Macquarie University in Sydney. Peter was co-director of Climate Futures (university research centre) from 2012-15 and has been an active researcher on resilience and the governance of disaster for over a decade – mainly in the UK, Australia and the USA. He has written two books on urban resilience: ‘The Everyday Resilience of the City (2008, Palgrave; w’ Jon Coaffee and David Murakami-Wood) and ‘Resilience and the City: Danger, (Dis)Order and Disaster‘ (2012, Ashgate). Peter has consulted on resilience for a range of government agencies and NGO’s internationally and is currently working on an international review of resilient cities, comparing and contrasting tensions in the governance of disaster around the world. Peter will present a paper titled ‘Tripping Rigidity Traps in Disaster Resilience: Typology and the Trajectory of Change’. This paper shows how a typology of disaster resilience activity can help track the trajectory of changes inspired by resilience. The typology follows the implementation of resilience thinking in practice as a means to uncover the difference between policy rhetoric and real action. Using the lens of disaster resilience as a crucible, the discussion demonstrates where regulatory experimentation has influenced the standardisation of emergency and security practices. Examples of this can be seen in the growth of general principles, non-statutory guidance, and international standards designed to improve resilience to disasters. What a typology of implementation actions uncovers is a creeping ‘neoliberalisation’ of ‘disaster resilience’. When this results in over-standardisation a ‘rigidity trap’ is created. However there is also an alternative implementation strategy emerging from collaborative planning and traditions of community development which interplays with innovative technological solutions (e.g. SMART technologies). I argue that whilst regulatory experimentation may enhance the resiliency of organisations and infrastructure, when those same standards and benchmarks seek to create ‘resilient subjects’ and ‘resilient communities’ the positive potential of resilience is undermined. Two likely future trajectories for the outcome and output of resilience-led governance are highlighted for further discussion. Our second speaker will be Sören Becker, a Researcher at Leibniz Institute for Research for Regional Development and Structural Planning in Erkner, Germany. His work focusses the emergence and socio-technical impact of new forms of organisation in the context of the German energy transition and beyond. He is the author of academic papers on topics such as remunicipalisation and community energy. Recently, his book “Ways of Energy Democracy: Emancipatory Energy Transitions in Europe” was published in German (title translated, co-authored with Conrad Kunze). Sören will speak about ‘Resilience and bottom-up energy projects – defending the democratising potential of renewable energy’. He will argue that the transition to renewable energy is often accredited for changing market power geometries. The background for this estimation is provided by a rising share of cooperative and small-scale private ownership in renewable energy generation capacities. While Germany and Denmark are notable for this trend to have become mainstream, other countries also witness the emergence of grassroots or local energy initiatives – community energy in the UK being just one example. Drawing from a study of fifteen cases in various European countries, Sören’s paper combines this development with the debate on resilience viewing from two different angles: Firstly, it will discuss examples where these endeavours have impacted on the resilience of peripheral and marginalised communities. Secondly, it will focus on the strategies and organisational arrangements of grassroots and local energy projects to foster their own resilience in the face of administrative obstacles, shifting legal frameworks, and internal organisational dynamics. The argument is that while the creation of social and democratic value has been prevalent with local energy initiatives, resilience is not derived from general considerations, but from incremental practices of adaptation. Understanding these practices in their social and spatial contexts, it will be concluded, will help to evaluate the future prospects of single initiatives and the general development of small-scale alternative energy projects.